Could a handshake prevent things from getting out of hand? 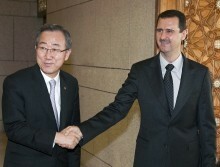 UN Secretary-General Ban Ki-moon (left) meets Syrian President Bashar al-Assad. Illustrative. Photo Courtesy of UN Photo/Eskinder Debebe. The Butterfly Effect builds off of the theory that if a butterfly flaps its wings, the impact of its action ultimately can impact a hurricane many miles away. In short, it argues that the world is interconnected and even small actions have unexpected consequences. It was 2005, and the world was looking brighter. Lebanon kicked out Syria’s army, Ukraine had a pro-West, pro-democracy revolution, Libya was in the midst of deconstructing their weapons of mass destruction and the world’s powerful bad guys seemed to be isolated into a two-nation axis of evil. It was a good year for the West and America. Is another Gaza war on the horizon? 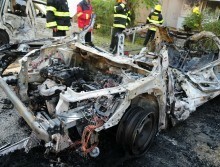 Israeli car hit by rocket fire. Illustrative. Photo Courtesy of IDF Spokesperson. Will US talk their way to a Middle East deal? 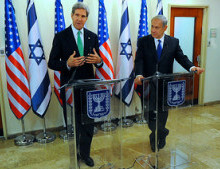 US Secretary of State Kerry and Israeli Prime Minister Netanyahu. Illustrative. Photo Courtesy of US State Department. I believe that this year will include dramatic headlines that will surprise, anger, thrill and confuse many. And what could do that, you ask? 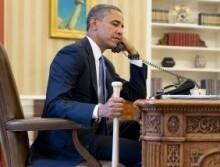 Well, I believe that this year the Israelis and the Palestinians will reach an interim deal. But that doesn’t mean what you think and certainly isn’t a good thing. 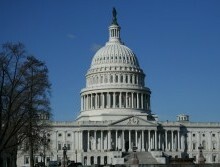 It’s not often that the US Congress, especially the Senate, is worthy of praise. That’s more often because of what they don’t do – like passing an annual budget, which hasn’t happened for years. But today, I’m applauding them for doing something, and doing it well: threatening Iran with more sanctions. Technically, the Senate hasn’t passed the bill yet, but over a quarter of its members are behind a deal that ups the pressure on Iran if they don’t show good faith in the nuclear talks with the world. Indeed, sometimes the best defense is a good offense.